Photo: Emily Rodriguez, left, and her sister Jazmine Reyes at Thadeus Stevens College of Technology in Lancaster. Studying science, technology, engineering and mathematics (STEM) related careers is no simple feat, but sisters Jazmine Reyes and Emily Rodriguez have had each other’s backs through their entire journey, in and out of the classroom. Jazmine and Emily have built careers around health science for most of their lives. “Being Latina in a STEM field has helped me find opportunities and I hope that it might inspire other Hispanic kids,” said Jazmine. They began this path as adolescents working at their father’s corner store. Jazmine, 28, is now a registered nurse for BAYADA Home Health Care and Emily, 24, is the food service coordinator for Cornwall School District. The two sisters were born to Lico Rodríguez and Margarita González and raised in New York until 2001. The family moved to Lancaster where Jazmine graduated from McCaskey High School in 2008 and Emily graduated from Lancaster Mennonite School in 2011. Jasmine continued her education to earn her associate’s degree in nursing from Penn College of Health Sciences in 2014, then her registered nursing license in 2018. Emily took her interests in nutrition to West Chester University and received a bachelor’s degree in nutrition in 2016 and continued her studies to become a registered dietitian in 2017. Jazmine and Emily’s careers both focus on the importance of children’s health. Jazmine looks after children with special needs, whether those needs are mental or physical. Every day, she performs full-body assessments and helps her patients with day-to-day tasks. Her job can range from cleaning and feeding the child to going through a school day or medical appointments with the child. Emily’s career serves many more children in her position with Cornwall School District. She oversees the nutritional plan of six schools, which requires her to manage the budget for food, build menus “as fresh and child friendly as possible… like mashed potatoes and carrots” and fulfill orders. The two sisters promote healthy living for children on the foundation of persistence and a passion for nutrition. “I want to provide a delicious healthy diet for children so that they make the choice to eat less unhealthy options and live healthier lives,” said Emily. While living in New York, the girls’ father owned a corner store that the girls were expected to help run. Their first job was when the girls were just 7 and 11. They would work behind the cash register assisted by one of their parents where they would practice basic arithmetic. From working at store as children, Jazmine and Emily learned a strong work ethic from their parents and fundamental math skills early on in their lives. Jazmine and Emily were exposed to the health care field as children through their grandparents’ doctor appointments. Their grandparents have had diabetes since the sisters were children, so the sisters helped monitor their grandparents’ health by attending appointments, administering insulin shots and practicing healthy eating habits. It was from caring for their grandparents’ diabetes that Emily and Jazmine developed a keen consideration for nutrition and health. Emily believes that these responsibilities made the foundation to their career paths in STEM. “I would practice giving insulin shots on fruit while Emily worked with our grandparents to make a better diet for their diabetes,” said Jazmine. Even though the sisters had the desire to study medicine, they did not know how to go about exploring a career in the field until they were introduced to Advantage Lancaster. Advantage Lancaster opened opportunities to the sisters that they had never experienced before. Co-founded by Shayne Meadows and Ty Bair, Advantage Lancaster partners with Thaddeus Stevens College of Technology to prepare middle school students for higher education. At the core of Advantage Lancaster’s work are five principles: educational opportunities, community involvement, appreciation for the arts, wellness, and career exploration. Students are provided with opportunities to delve into these principles through workshops, field trips and classes geared toward college. Jazmine began a volunteer position with Advantage Lancaster in 2008 which was previously called Exit Lancaster. While offering her time at the educational nonprofit program, her sister Emily decided to join her sister in helping to feed and supervise activities for students. “We were like a two-for-one package deal. And they put us to work,” said Emily. The sisters were able to practice building healthy diets by coordinating the student meals. Between volunteering as nutritionists and tutors for science classes, the sisters also utilized services like chemistry and biology preparatory courses that Advantage Lancaster provided to their benefit. 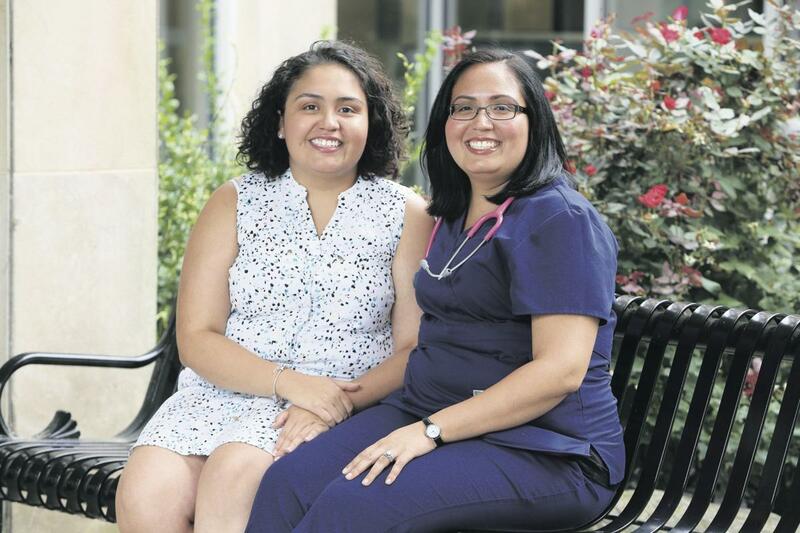 Both sisters became more familiar with the expectations of the medical field by strengthening their science background with Advantage Lancaster. Jazmine and Emily grew close to the coordinators of Advantage Lancaster as they assisted the program for several years. Meadows and Bair became educational mentors to Jazmine and Emily. The sisters did not know how to prepare for college, so Meadows and Bair wrote referrals for their schools and helped them plan. “We have enough ambition and determination to be successful, but our success has come from working with Advantage Lancaster. There’s enough faith in that,” said Emily. The sisters approached the challenges of college together. They would help one another with classwork and motivate each other to overcome their obstacles. “Jazmine would help me with my math and statistics, and I would help her with her essays and writing courses,” said Emily. Jazmine describes her pursuit of a nursing career to have been difficult and competitive, but the courses were not the full extent of her challenges. In 2011, Jazmine suffered from a kidney infection that set her back from her studies. She failed her classes that semester and had to work extensive hours to pay for her hospital bills. When she recovered from the infection, she continued her education until she was a registered nurse. Emily faced a similar challenge while moving into her college dorm at West Chester University. Emily overworked herself and unknowingly tore her hip muscle. After a year of experiencing sharp pains on her lower torso, she went to visit a doctor. The doctor identified the problem and suggested that Emily take several months to recover. Emily decided to take her next college semester off until she had healed. To her surprise, she healed in a matter of weeks and quickly turned her focus back to school with the help of her sister. Though they struggled in college, Jazmine and Emily embrace the challenges of their careers. Jazmine began in hospice care, where she accommodated and cared for terminally ill patients. During her time there, Jazmine learned how to properly care for people with various disabilities. Emily often reflects on one particular challenge that turned out to become very rewarding. Emily had to find a way to provide lunch for an English as a Second Language summer program in her first month of work. She referred to her experience at Advantage Lancaster and her education to provide an entirely free lunch for the students in the program. “It wasn’t easy for my first month on the job but the thank-you card made it worthwhile,” said Emily. Studying STEM subjects gave Jazmine and Emily the ability to incorporate their interests into their careers. Health science is a field that is both meaningful and dear to the sisters. They get to perform research that is current and impactful while investing time and effort into the health benefit of children. The two sisters enjoy working with children because they want to provide a better future for children, just as their mother did by moving to Lancaster. Jazmine and Emily often thank their mother and mentors for revealing the opportunities that led the sisters to their dream jobs. “We both struggled but we had our mentors and role models, but more importantly we have each other. I know that we’ll always be there for each other,” said Jazmine.